Perched on the highest point between two fishing villages in this corner of eastern Uruguay, I felt as though I had stepped off the map and disappeared. It was exactly what I had hoped for when I booked my trip here. Last August, when I went to Donetsk to see my family, the city felt sleepy as always. Since then, more than 3000 people have died, an international plane was shot out of the sky, and my family and their city have been caught in a war they neither expected nor supported. Gazing at the calm Baltic Sea lapping up the wide, sugary and entirely empty sands of Stilo Beach in the country's north on a February afternoon, I wondered how this majestic, serene piece of natural beauty could have escaped the international spotlight. Nothing ever seemed to change in Donetsk over the thirty summers I went there to visit my family. Suddenly, winter came and my family got caught in a civil war they neither expected nor fully understood. Who said that love is the lifelong emotion that wives feel toward their husbands and mothers toward their children? Why can’t love be a sudden burst of sunshine in a dusty shop in Old Jerusalem? For me, the most romantic way to get married was to elope. I didn't always feel this way. A decade ago, when I was engaged for the first time, I spent a stressful year diligently planning what was supposed to be the most important day of my life. Russian chefs are starting to tap their native roots and the country's geographic diversity to show that their country's cuisine is more than just potatoes and vodka. On a recent morning in Sausalito, media consultant Myles Weissleder pulled up to the Paradise Bay Restaurant, walked out on the dock and got into a blue inflatable dinghy. Emeryville's Golden Gate Badminton Club is where those in the know come to play badminton — the world's fastest racket sport, as well as its most misunderstood. 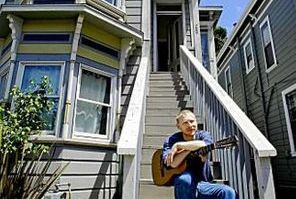 When 28-year-old software engineer Andrei Soroker bought a faded lavender Victorian fixer-upper in West Oakland, the $500,000 price tag didn't seem like a bad deal. 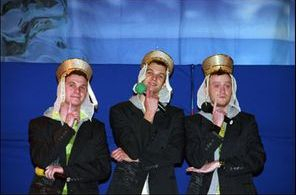 Looking in the mirror after every joke, the Illegals pretend to see the blinding stage lights and the cheering audience that will greet them in two weeks at the popular Russian comedy competition called KVN.